The cat command (short for concatenate) is one of the most frequently used flexible commands on Linux, Apple MacOS X, *BSD (FreeBSD / OpenBSD / NetBSD), Unix-like operating systems. It is useful to display text files on screen, copy text files, combine text files, create new text files and more. If you cat command with colours, try ccat app. ls is a command to show files in Linux and Unix-like operating systems. A ls command first appeared in a version of AT&T UNIX as well as in Multics. BSD and GNU Coreutils package provides the ls command with minor syntax changes. There is now third alternative named exa. It is a modern replacement for ls. A shell script went wild due to some bug, and the script overwrote a binary file /bin/ping. Here is how tor restores it. I already wrote about auto-completion in the MySQL/MaiaDB command-line client using an auto-rehash feature. Recently I found out a new tool called mycli. It is a command line interface for MySQL, MariaDB, and Percona with auto-completion and syntax highlighting. The neofetch command like utility written in a bash shell. The main purpose of neofetch is to be used in screenshots to display other users what operating system or Linux distro you are using including theme, icons, hardware config and more. This command shows info about your system next to an image, your operating system logo and other info. Neofetch version 5.0.0 has been released. Let us see how to install the latest version of neofetch on a Linux or Unix-like system to get system info. A vim plugin manager is a must for any die-hard vim user. You can find a few option available out there. My personal favorite is vim-plug which is a beautiful and minimalist plugin for vim. Let us see how to install and use this plugin on Linux or Unix-like system. Recently I come across a nice little nifty tool called pssh to run a single command on multiple Linux / UNIX / BSD servers. You can easily increase your productivy with this SSH tool. 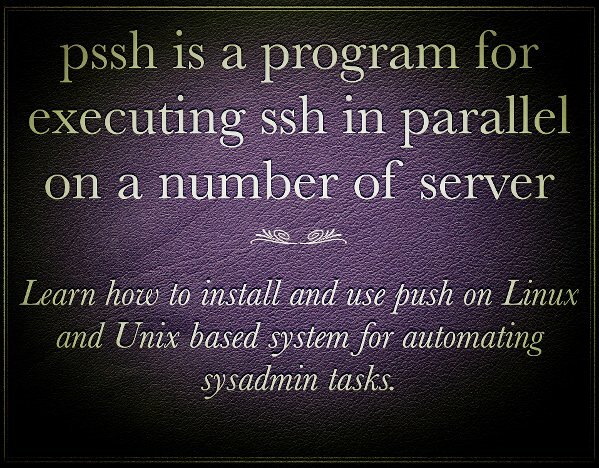 Let us see how to install and use pssh on Linux and Unix-like system. Oops! I did it again. I thought I was logged into my home server. Turns out I rebooted the db server. Another my not so favorite is typing “shutdown -h 0” into the wrong terminal. I know a few people who have admitted to doing that here. Is there any end to the madness? Do I need to suffer from accidentally random reboots and shutdowns? After all, it is human nature to make mistakes, but one should not keep on making the same mistakes again and again.